My first honda (CB7) and its 99% stock. I just got a 1992 Honda Accord LE. Its the 2.2L and 5 speed manual. It is 99% stock the only mods done to it were a tow bar for an RV and a new head unit that has bluetooth. The car has no rust and looks clean as hell. Interior is damn near mint. No rips on the seats anywhere and the steering wheel is no torn up. Minor dents on the trunk but an easy fix. It has the F22A. I am looking to do a swap eventually. What do you guys think? 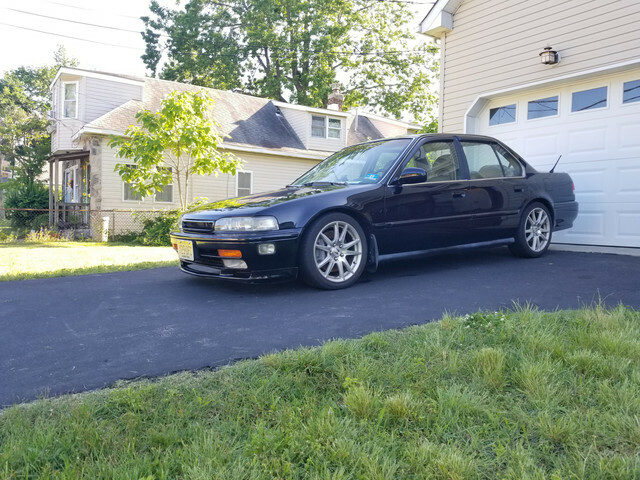 Anything I should be loooing out for as a first time CB7 owner? Discuss below! That looks really clean for the car, given the age! Great find! By the way, it's an LX, not an LE. I would heavily go over the stickies in the Technical and Performance section of this site. They will help to address idle problems, hesitations and any other common issues to help you get the car running great. The F22A1 is a decent engine when it's in good condition. And before a swap is done, you can get a little bit more out of the F22A1 with about $500 and a few hours under the hood. Yes, that was my mistake it is an LX. What exactly could I get done to it? It’s going to be a minute before I do a swap because I deploy in September. Thanks! Go to the Beginner Technical/Performance section, there is a sticky near the top of the page. Nice CB you got there. I would first remove the RV hitch unless you are planning on towing it. What branch are you in? We have a couple military members here including myself. Welcome to the CB family. This reminds me of my dads first CB back in 1992 only thing his was an EX. I am also military as grumpy stated above there is quite a few of us here. Where might you be headed to? Welcome to the site and very very nice CB you have there. Congrats on the good find. Its getting harder and harder to find these in good shape and stock. How many miles are on it? My grandfather had a 92 accord as well I think that’s why I gravitated so much to the Cb7s. I am in California right now. SoCal. Thanks! Schex, since you’re in SoCal right now I have the stock EX front lip if you need something after you yank off that hitch. You can have it. Just hit me up. That would be cool! Yeah I got to get the cars front end up to take the tow bar off but I can do it soon. I also got a new grill and emblem on the way! Thanks man! how many miles? I love while CBs with blue interiors. I have a stock LX headunit if you want to complete your stock look after you remove the tow bar hehe! My recommendation is get yourself a ROH kit from a 99 CL the ease of doing front brake jobs would be so much better. Drum to disc conversions are very easy on these cars as well, all you would need is a set of rear trailing arms with disc brake setup and matching e-brake cables. Your car reminds me a lot of my first hand me down.